Try these dry scalp home remedies bound to relieve the itchiness and tight feeling that everyone experiences every now and then. A dry scalp is certainly uncomfortable. Nonetheless, it’s also easily treated with home remedies, medicated shampoos or over-the-counter treatments. A dry scalp can occur to anyone and isn’t necessarily a medical skin condition. It is important to mention that eczema or psoriasis can contribute to having a dry scalp. If this is the case, medical treatment is advised. However, such cases are quite rare. One factor that can contribute to having a dry scalp is temperature. For instance, during summer, excessive dry heat can lead to the skin drying as well. In winter, extreme cold can also affect a healthy scalp. One thing that can give away a dry scalp is the flaky dead skin that falls out constantly. Not to mention the constant itchiness. The good news is that if having a dry scalp skin isn’t caused by eczema or psoriasis, we’ve compiled a list of the best dry scalp home remedies you can try at home. Regain the health of your scalp and the beauty of your hair along with your confidence with a few easy steps. When it comes to quickly healing a dry scalp, there’s nothing in the world like natural organic oils easily absorbed by hair follicles and the skin alike. Sesame seed oil is one of these amazing oils. Used as a home remedy for dry scalp, sesame oil will offer that much-needed relief from itchiness, while being nourishing, lubricating and stimulating the release of natural sebum. When you’re looking for quick dry scalp home remedies, just heat two tablespoons of sesame oil in a double pan. Apply it to the scalp skin and massage thoroughly for approximately ten minutes. Then, wrap your hair and the scalp in a protective towel or scarf. The results are almost immediate. Nonetheless, if you feel the need, the treatment can be continued for as long as necessary. Just make sure to use a mild shampoo to wash off the sesame oil and rinse thoroughly. There’s nothing like readily available home staples that can be used as dry scalp home remedies. Lemons make no exception. The antiseptic and slightly acidic properties of lemon juice make it an excellent dry scalp home remedy. Simply squeeze the juice of two lemons and apply thoroughly on the scalp and hair. Let it sit for five to minutes and rinse with mildly warm water. When you’re using such dry scalp home remedies as lemon juice, there’s no need to even use shampoo to rinse them off. Lemon juice will leave your hair shiny and beautiful while getting you rid of the flaky skin typically associated with dry scalp. Did you ever think that bananas can be used as home remedies for dry itchy scalp? We were surprised to find out that they successfully replace the best of conditioners. In addition, due to the essential nutrients and oils in bananas, they leave the scalp nourished and moisturized. This is ideal to reduce inflamed skin and help you fight off the itchiness and the flaky skin. For best results, peel two bananas and blend them together with a ripe avocado. This scalp and hair mask can be applied for 20 minutes to half an hour. Let it sit and rinse thoroughly with lukewarm water. Here we are, back to the essential oils that should become part of your dry scalp home remedies collection. Coconut oil is great for the skin, hair and to treat a number of inflammations or skin conditions. As it is rich in beneficial fatty acids and essential nutrients, it nourishes and protects from the first time you apply it on any afflicted area. Thanks to the antiseptic and anti-inflammatory properties, coconut oil is also a mild deterrent for bacteria that could make a dry scalp even worse. Moreover, it helps create a protective layer that keeps the skin moisturized for a longer period. If you want to use it a home remedy for dry itchy scalp, you can apply it directly to the skin and let it sit for half an hour. Alternatively, coconut oil can be used together with your shampoo. Just mix one part mild, perfume and parabens free shampoo with one part coconut oil and apply thoroughly on your hair and dry scalp. Rinse with lukewarm water to keep the coconut oil from hardening on the dry scalp. 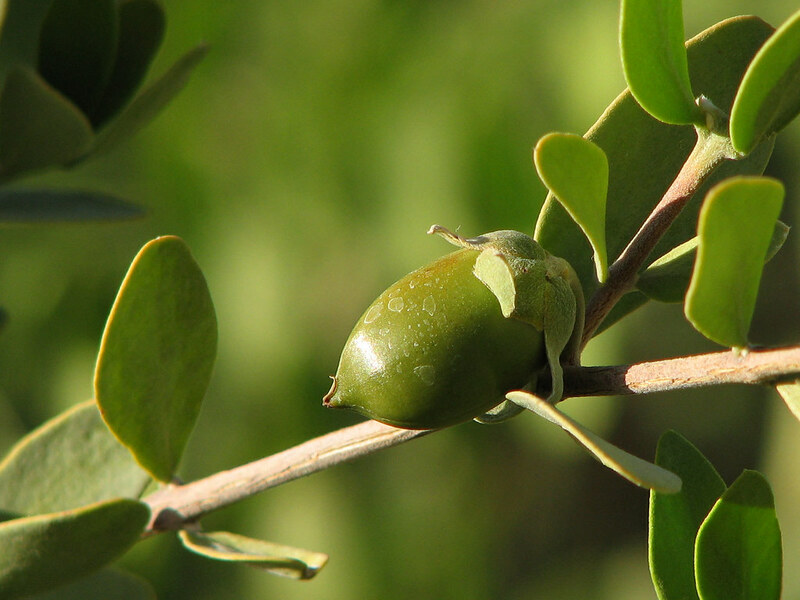 Jojoba oil has been used for ages as a moisturizing treatment for dry and flaky skin. This is due to the fact that its molecular structure closely resembles that of sebum naturally produced by our body. So speaking of dry itchy scalp home remedies, jojoba oil is an excellent hydrating, moisturizing and rejuvenating treatment. Heat two tablespoons of jojoba oil in your palms, little by little. This oil is highly sensitive to heat. Thus, leaving it on direct heat for too long can spoil the properties of this home remedy dry scalp. Massage the oil thoroughly on the entire surface of the scalp. The itchiness and dryness of the scalp are instantly relieved. Rinse the jojoba oil after half an hour. Witch hazel is one of the best dry scalp home remedies. With such a vast variety of applications as a home remedy, it should come as no surprise that witch hazel is an excellent dry itchy scalp home remedy. Because it is a natural astringent, much like lemon juice, witch hazel relieves the itchiness caused by a dry scalp in no time. You can make your own witch hazel infusion at home or seek essential extract of the herb. If you use the latter, mix one part witch hazel extract with two parts water and apply it on the dry scalp. Leave it on for five to maximum ten minutes and then rinse thoroughly. Honey and olive oil are a match made in heaven when it comes to dry scalp home remedies. While they can be used separately as home remedies for dandruff and dry scalp, these household items work best together as far as treating a dry scalp is concerned. Honey has been used for centuries for its nourishing, antiseptic and anti-inflammatory properties. Olive oil is easily absorbed by the skin and hair alike, providing instant nourishing and moisturizing. Thus, you’ll have a healthy scalp in a blink of an eye and the pesky flaky dead skin and itchiness will be gone. Preparing this home remedy for dry flaky scalp is a breeze. Use a mason jar immersed in a pot with hot water to heat half a cup of virgin oil mix. Add two teaspoons of honey and blend until the two ingredients are fully incorporated. Use the mixture as a dry scalp mask and leave it on for approximately 10 minutes. You can use a towel to wrap your scalp while the olive oil honey mix is on. Wash the mixture off with a mild shampoo that won’t harm your scalp further. Alternatively, you can add vegetable glycerin to the mix if you’re looking for enhanced home remedies for dry flaky scalp. Use the same procedure to heat up four tablespoons of olive oil. Add two tablespoons of vegetable glycerin and two tablespoons of honey at the end. Stir until the ingredients are fully incorporated. Use the mixture, in the same way, described above for instant relief of itchiness and a healthy scalp. Tea tree oil wouldn’t be the typical suspect as far as dry flaky scalp home remedies are concerned. Nonetheless, tea tree oil is one of the most praised dry scalp home remedies for the antifungal and antiseptic properties it carries. Tea tree oil also has a light molecular structure, which helps the scalp absorb it faster and easier. Use the tea tree oil as an enhancement for your usual shampoo or hair conditioner. The flaky skin which looks so unaesthetic and is caused by the itchiness of the dry scalp will be gone in no time. Use tea tree oil as often as you need to in order to maintain the health of your scalp and the luster of a healthy mane. Home remedies for dry scalp and dandruff come in a variety of forms and with a variety of charming fragrances. We tried this mixture of coconut oil, lemon juice and grapefruit juice and not only does it leave your hair smelling divine, but it also relieves the itchiness of a dry scalp and heals it quite fast. It’s incredibly easy to make this home remedy for dry scalp. All you need to do is squeeze the grapefruit and lemon. Mix the juice from these two citrus fruits together. Warm three tablespoons of coconut oil for just a few seconds. Add two tablespoons of the juice mix to the coconut oil. Let the blend cool for one minute. Use the coconut oil, grapefruit juice and lemon juice mix to massage your scalp. Make sure the blend is thoroughly applied. Leave it on for about 20 minutes and use a mild shampoo to rinse it off. You will love the healthy nourished feeling thanks to this blend of natural ingredients used as dry scalp home remedies. Mayonnaise may be excellent in salads and foods. Nonetheless, as it combines eggs and vegetable oil, it can also act as nourishing and moisturizing hair and scalp mask. Add just a few drops of vinegar to the mayo and you’ve got yourself one of the best extremely dry scalp home remedies. Use the best organic ingredients to achieve best results with this solution. Vinegar is a powerful disinfectant and astringent which will help you wash away possible bacteria causing scalp dryness and itching. Apply as much mayo as needed on the scalp. Massage gently to spread it evenly on the entire surface. Leave it on for half an hour. For best results, cover your hair with a shower cap. Rinse the mayo off with shampoo and mildly warm water. Packed with fatty acids, minerals and vitamins, these delicious fruits are super moisturizing and nourishing for the skin and hair. Many cosmetic products use avocados specifically for the properties they carry. Nonetheless, making your own cosmetic products that can act as dry scalp home remedies is less expensive and far better. Here is how to make your own home remedy for dry scalp using avocados. Blend one avocado with two tablespoons of olive oil. Add one teaspoon of honey and blend again. This delicious paste can be used as a hair mask and an ideal relief for itchiness caused by dry scalp. Thanks to the cocktail of nourishing nutrients in the blend, the dry flaky skin will be removed and the deeper layers of the scalp skin will be regenerated and healthy. As unlikely as it sounds, beer is, in fact, a great conditioner for the hair and a nourishing solution for dry scalp. Because of the yeast and the oats combination used in the production process, beer continues to carry the beneficial nutrients of these ingredients. To use beer as a home remedy for dry scalp, mix two cups of beer with two tablespoons of apple cider vinegar. Use this solution as a shampoo, applying it to the hair, as well as to the scalp. Leave it on for 10 minutes after you made sure it’s evenly spread. Rinse with lukewarm water. You’ll notice how the scalp and hair look healthier already. Dry scalp can be uncomfortable and unaesthetic. Nonetheless, a dry scalp can sometimes occur due to environmental factors such as extremely high or cold temperatures or due to an unbalanced diet. While medical conditions such as psoriasis or eczema may underpin the occurrence of dry scalp skin, such cases are fairly rare. Medical advice and supervision are of course preferable in such cases. However, when dry scalp and flaky scalp skin aren’t underpinned by medical conditions, dry scalp home remedies are the best approach.